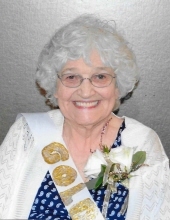 Mabel Lee, 90 of Drexel, Missouri passed away September 19, 2018 at Cass County Memorial Hospital in Harrisonville, Missouri. Funeral services will be held 12:00 pm Saturday, September 22, 2018 at Mullinax Funeral Home, Drexel Chapel (660-679-0009). A visitation will be held prior to the service on Saturday from 11:00 to 12:00 pm, also at the funeral home. Memorial contributions may be made to the Drexel RIO. Messages of condolence may be left for the family at www.mullinaxfuneralhome.com. Mabel Ruth Lee was born November 26, 1927 in Licking, Missouri to Heber and Elzina Cotton Sherrill. She grew up in the Licking area and graduated from Licking High School in 1945. After school, she went to work at a furniture store until she met and married Russell Bland Lee in 1950. To this loving union nine children were born. Russell and Mabel would raise their family in the Drexel, Missouri area. Mabel would spend most of her time as a homemaker caring for the family she dearly loved. She also enjoyed gardening, reading, working crossroad puzzles, and writing letters to friends and loved ones. She never missed sending birthday cards, and if you were someone special, you would also receive a beautifully hand written note as well. When her children were grown, Mabel went to work with her husband at the Drexel Schools as a janitor. Mabel was preceded in death by her parents, husband Russell Lee, daughter Barbara Bounds, infant children Mark and Mary, by her sister Mary Edwards, and by a brother James Sherrill. She is survived by her sons Joseph and Gordon Lee, both of St. Clair, MO., daughter Marti Huffman and husband Bill of Overland Park, KS., daughter Rita Rose of Olathe, KS., daughter Paula Doran and husband David of Overland Park, KS., daughter Stacy Bloodgood and husband Jon of Louisburg, KS., 13 grandchildren, 14 great-grandchildren, two great-great-grandchildren, and her brother Robert Sherrill and wife Carol of Licking, MO., along with many nieces, nephews, and extended family members. Mabel will be dearly missed, and forever remembered as one of the most sweet and sincere people to have lived. To send flowers or a remembrance gift to the family of Mabel Lee, please visit our Tribute Store. "Email Address" would like to share the life celebration of Mabel Lee. Click on the "link" to go to share a favorite memory or leave a condolence message for the family.